The March meeting was attended by 19 members and friends. Bob Torbet led the short business meeting. Jack reported that this year's paid membership was 25 to this point, with more expected as people came back to Ohio after travels afar. The previous meeting minutes were approved. Bob mentioned an upcoming event that we have been asked to help with and Jack went into more detail. Basically, The Hancock county museum would like our club to organize an old car event around the unveiling of their new exhibit. 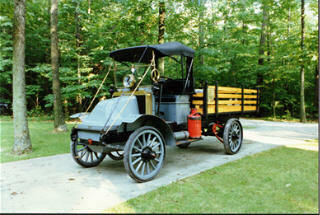 The exhibit is a Findlay produced 1913 Adams Truck. They'd like at least 20 pre-WWII automobiles as a static display. Bill Phillips was instrumental in obtaining the Adams; so, he shared a little bit of its story. The membership agreed to organize the event, with many members tentatively vowing their support. Dave Benny brought up the Membership books that the MTFCA has asked Harris Publishing to put together. Many of us have received the mailed material and some have even received the phone calls (solicitation) from Harris. We can all agree that $80 for a list of members is a bit much, no matter how its dressed up and packaged. Dave summarized a letter that he sent to Jay Klehfoth and the response that he received. Basically their saying that the Club is not getting anything for the publication. They've tried to do this in the past and lost money on it every time. This is just a service to the club members and no one is under obligation to reply or buy. The meeting was closed and Bob quizzed us on Model T history. Priceless prizes were given out for correct answers. Bob ended up giving everyone something. Dave Nolting showed his re-engineered floating hub that was a collaboration along with Ben Staats from Mount Vernon, Ohio. Dave did the drawings and bought the parts. Ben setup the CNC program and ran the machine. We also had an update on the two high mileage engines. Since the topic of the MTFCA directory came up in the last meeting and their was some misinformation bantered around the room, I thought that I'd present Bruce McCalley's response from the MTFCA forum as a good explanation of the situation. It seems that a number of people have the impression that the MTFCA roster is a money-making project for the club. Not so. The only reason we got into the project was because of a number of requests for a roster. The MTFCA has no investment in the project other than furnishing a list of our members. Harris Publishing pays for everything. They are a large firm dedicated to the publishing of such rosters for schools, clubs and whatever. The MTFCA will receive no money from Harris. The roster will be a large one with over 8,000 names, photos of member's cars (proving they send the photos) and in an 8-1/2 by 11 format. There will also be color (not just black and white). Naturally, Harris hopes to sell these to members and will make some effort to do so. If anyone doesn't want to be bothered all they need to do is contact the MTFCA office and they will see to it that their name is added to the "do-not-call" list. Furthermore, the data will not be used for any other purpose than the roster. members are seen in many of the usual activities of a normal after meeting social time. To the right is the refreshment table, where folks gather to drink coffee and eat brownies, cake, or cookies that Marilyn has provided for the evening. The group to the back right was discussing cars other than the Model T. The group around the table in the middle were discussing machining issues for some Dayton hubs. And, the guys on the left were remembering a shared trip to an eventful Midwest auction. Above left we see Melvin letting a couple of the guys in on a little secret that he has for tightening up the spark and throttle levers on the steering column. He claims that it doesn't change the appearance of the quadrants at all. Melvin is always looking for a better way to do the same old thing. Its his best quality. A couple of the engines that Jack has gotten in recently have had the horseshoes brazed permanently in place. I had never seen this done and was wondering why I hadn't thought of the same solution. Its always a chore, when replacing the inspection pan, to get those shoes to line up with the first couple of bolts so that the rest of the bolts can be inserted and then tightened down. I suppose that the downside would come when one or more of the thread holes stripped out and it became necessary to ream and re-tap the thread to a larger sized bolt. A one-ton Adams truck - made in Findlay in 1913 by Adams Brothers and Co. - has made its way back home. The 92-year old truck was recently donated to the Hancock Historical Museum by Emma Jean Fisher, widow of Kenneth Fisher. The Xenia couple had purchased the Findlay-made truck in 1968 from the son of a man who had an Adams dealership in Dayton. at 2 pm Sunday in the Transportation Gallery, located in the barn behind the main museum buildings. The vehicle is in excellent shape. The Fishers came across the antique truck in 1968. Because the vehicle had been sitting in a barn for nearly 30 years, most of the repairs involved cleaning, and the renovations took about a year. Mrs. Fisher helped by making a new buggy top. The reason it survived is the man who had the dealership in Dayton for Adams trucks kept this one, and then his son owned it. Ken Fisher bought it from the son, so the Fishers were only the third owners. Ken just restored it and kept it in good order, didn't really use it showed it, so that's why it has survived. But the truck probably wouldn't have made it "home" if it hadn't been for the persistence of Findlay resident Bill Phillips, an antique car buff who is particularly interested in vehicles that were made locally. He first heard that an Adams truck had been seen in the Urbana area in 1970. "It's been on my mind for a number of years to get it here," he said. Phillips spent the next 14 years trying to track the vehicle down. He placed advertisements in old car magazines and even wrote to the Urbana Chamber of Commerce. Finally, he ran across someone who knew Fisher. And in 1985, her persuaded the Xenia couple to bring the truck to Findlay for the annual Steam and Gas Engine Show. While they were in Findlay, the Fishers toured the museum. When Fisher died in October, Mrs. Fisher decided to give the truck to the museum. She was present at the unveiling. 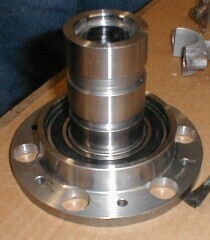 A beautifully machined floating hub sat on Jack Putnam's assembly table at the last meeting. The hub is the result of a collaboration between Dave Nolting of Ashley and Ben Staats of Mount Vernon. Dave did the blueprints and bought all of the steel, bearings and retainers; while Ben provided the CNC expertise. This hub was designed to keep the wheel on the car in case of a broken axle. It also has the advantage of being able to keep the original bolts on the outside of the wheel, so as to keep the original appearance. I think that they've done a wonderful job of looking at and existing product and improving on it to make a better product. Don't look for them on the market too soon. Dave plans on testing it for a year or so to make sure everything performs as expected. 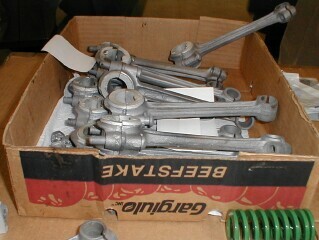 Rods are sitting in a box ready to be machined and sorted at Jack's shop. Yes, its that time of year. Cold weather is always the best time to pour these things; so, Jack Putnam and Bob Torbet have been tinning and pouring every rod in sight. Machining and weight matching will come later in the air conditioned shop. For now they'll wait while other projects take over. Like, Jack finally getting around to working on his project cars. There are three of them just waiting for a little time to tackle the assembly of all of the collected parts. 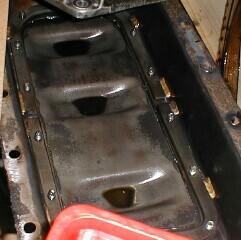 The rods on the left are newly poured rods. 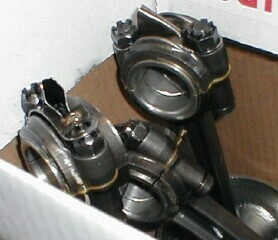 The ones on the right were removed from an engine that Jack set up a couple of years ago - that are in for their 30,000 mile checkup. Hap Tucker is trying to put together as much information as he can about the different body manufacturers of the Model T Ford. As many of you know, Ford had many of the pieces assembled elsewhere and either shipped them in or brought them together at a remote location. It seems that the very same 1915 touring body made by Fisher Body may not be the totally same construction as the Wilson Body made near Detroit. Hap has been using cyberspace to draw this information together. Take a look at your floorboards and see if you can find the number. Let us know what you find at the Wednesday night meeting. Here are a couple for your inspection.